We had a college student staying with us for a couple of weeks who works with Mike. She had to be out of her apartment the middle of the May and she couldn’t move into her new apartment until June 1st. We have a couple of empty bedrooms since our kids are mostly grown and are on their own, we offered her to stay with us those 2 weeks. She turned out to be a foodie like me, so we got along great. I had some shrimp in the freezer, but wasn’t sure how to make them. Our college student had a recipe that her mother makes with chicken and she suggested we try it with the shrimp. It turned out to be so delicious I could have eaten the whole dish by myself. 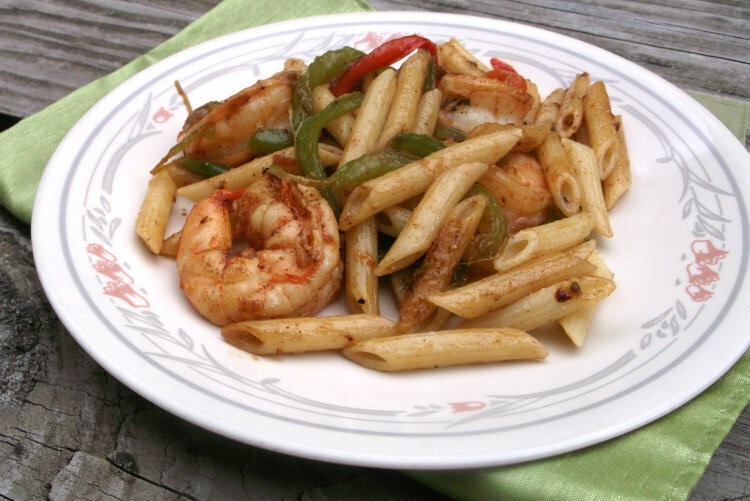 The Cajun seasoning gave the shrimp and the pasta a nice amount of heat. I love foods that have nice colors to them, I guess that it true that we eat with our eyes first. 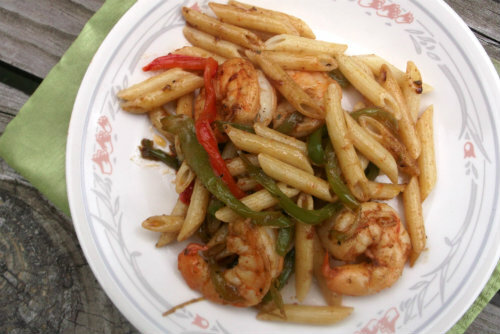 And one thing about this dish it had nice colors with the red and green peppers along with the pink shrimp. 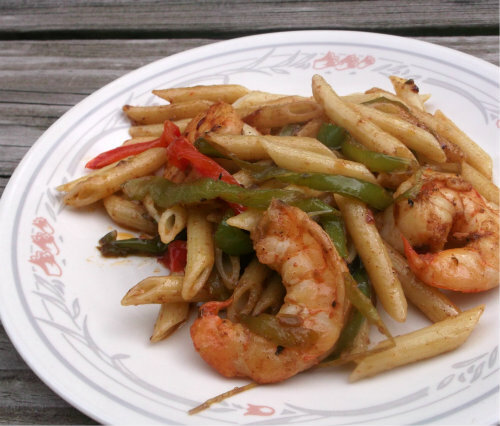 I am sure that I will have to try this recipe with chicken, since a certain member of the family doesn’t eat shrimp, but I know that he would love it with chicken. 2. Sprinkle shrimp evenly with Cajun seasoning and about 1 teaspoon of salt or to taste. Melt 1/4 cup butter in a large nonstick skillet over medium-high heat; add the shrimp, and saute for 3 to 5 minutes or until it turns pink. Remove shrimp. 3. Add the bell peppers and onions to the skillet and saute 9 to 10 minutes or until vegetables are tender and the liquid is evaporates. 4. Mix the lemon pepper, basil, and garlic powder together in a small bowl. Return the shrimp to the skillet and add the mixed seasoning to the shrimp mixture. Cook, stirring often, over medium-low heat 3 to 4 minutes or until thoroughly heated. Add the pasta, toss to coat. Serve immediately. This looks so good. I love finding new shrimp recipes because it’s one thing the whole family loves. Funny how you started out doing someone a favor and ended up with a fellow foodie visiting and sharing recipes. This looks great, nice idea for a weeknight meal. Now that is my kind of pasta – it looks terrific! You’re a good person 🙂 It’s nice to live with another foodie. We had a friend over for a week and it was so much fun to eat and cook together. Nice recipe! I love Cajun seasoning – so flavorful. Never thought of a shrimp pasta like this, though, and I really like the idea. And you’re so kind to help out that student!